For a moment that afternoon, Dodhia seemed the most beautiful place imaginable. From their stilts, buildings made of wood poked out from languidly rolling expanses of neon-bright grass. But the water-weathered buildings betrayed the ephemera. Despite four foot stilts, flood waters reached the bottom of homes. The water that nourishes Dodhia also wreaks havoc on it. Dodhia is one of the 2,500 river islands of the Brahmaputra. These islands, called chars in Bangladesh and saporis in Assam, have 2,300 villages, which are home to three million people. On some islands, villages are just a few huts, while the largest and best known sapori, Majuli, has a population of 1,50,000. Despite wide variations from island to island, all saporis are similar in their dependence on and vulnerability to the Brahmaputra. "The Brahmaputra is a young river.It can get as wide as 18 km across during the summer monsoons. It is still carving out its final path before it becomes deeper and thinner," said Sanjoy Hazarika, an expert on north east India. Hazarika, who is the managing trustee of the civil society organization, Centre for North East Studies and Policy Research (cnes) added that, "While deceivingly calm to look at, the river is highly volatile, causing extensive flooding and erosion. People have to camp in cramped relief camps for sometimes weeks. They suffer every year." Upon returning, they find massive property damage with correspondingly severe economic consequences. According to cnes's research, the economic damage by flooding amounted to Rs 4,400 crore between 1953 and 1995. In large part, these damages are tied to the fact that almost everyone living on the saporis earns a living through either farming or dairy. Over 90 per cent of the cultivated land on the river islands is flood-prone. Large numbers of cattle succumb every year to hunger and disease. "The floods force the sapori dwellers to make new investments, just to get back to the level where they were before the deluge," Hazarika said. The floods also have an impact on the health of people. The temporary relief camps lack proper sanitation. "During the floods and in the weeks that follow, entire communities, and especially children are at risk for water-borne diseases, including diarrhoeal diseases, and vector-borne diseases, notably malaria and Japanese encephalitis. The floods leave the islands completely separated from the mainland, making hospitals, pharmacies, and other health services nearly impossible to access," Hazarika said. 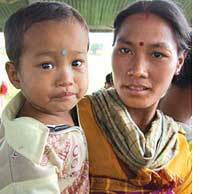 Dodhia is one of the 14 saporis in Dibrugarh district of Assam where cnes launched a project in 2005 to improve the health of the sapori dwellers. The project found an innovative way to deal with the inaccessibility of the islands instead of bringing the sapori dwellers to mainland doctors, they put the health clinic on a boat. As the original project proposal stated, "The Brahmaputra could be used to respond to and answer some of the very problems and challenges it caused." This idea won Rs 15 crore of start-up capital through the World Bank's India Development Marketplace 2004 competition, and is now funded through partnerships with the National Rural Health Mission (nrhm), unicef and a number of private companies and individuals. The two river boats, Akha (hope in Assamese) and Shanaz (less sentimentally named after the wife of a large donor), now provide immnunization to mothers and children and routine check-up services to 50,000 people on dozens of river islands in five districts of Assam Dhubri, Morigaon, Dibrugarh, Dhemaji amd Tinsukia. F our more boats are in various stages of construction. To reach the islands, the boats leave Dibrugarh town, staying on the river for three or four days to see multiple villages on each trip. At night, Akha finds an uninhabited sandbar and docks for the night, and the mood becomes relaxed and jovial. The crew catches fish in the river for dinner, while the two doctors play volleyball badminton on the shore, and chat about their lives. The three nurses, one paramedic and the pharmacist join in. Once Akha sails into a sapori island on the river, the medical team heads towards a clinic in a building close to the shore-this building is usually provided by the community. The staff sometimes has to shift to a small wooden motorboat to navigate the shallow waterways that lead to the village. It is tough life but they don't mind it. The medical professionals have private practice for three days a week. In travelling with cnes, I found that while flooding is in itself an immense problem, the deeper issue is the geographic isolation that the Brahmaputra forces on the saporis. 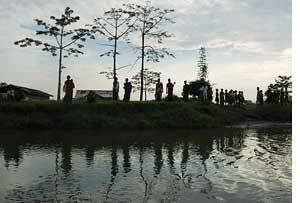 "The river's dependents have problems of access to basic infrastructure. Those on the islands are the most marginalized, isolated, and voiceless," Hazarika said. The islands have no roads, no electrification, and no sanitation facilities. The education system, too, is floundering--where schools do exist, for the most part they only go up to the fourth standard. Even these schools tend to be one room, single-teacher outfits trying to accommodate large numbers of students. Rabindranath Panday, the teacher and headmaster at the government lower primary school on Chokia sapori, teaches 120 to 150 students spanning five grades in a single room. When asked about the challenges facing education in his village, he said that lack of teachers is the biggest problem facing Chokia. Panday described how the school has to be shut down whenever he goes on official work. c-nes staff members and teachers on other saporis echoed his frustrations. But providing education on the islands does not seem to be on the government's anvil. 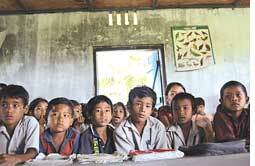 Dwibendu, Dibrugarh's district officer for teacher training of the Central government's S arv Shiksha Abhiyan (education for all programme), admitted that there were currently "no special programmes" to address sapori education. Instead, he suggested that this was an ideal space for cooperation with ngos. "We are open-minded to welcome all who come to us," he said. He then listed a number of ngos currently working in the district to increase enrolment and improve the quality of education. Some of these groups supply educational material and sports kits, others run after-school clubs for girls in tea communities. cnes has also branched into education. ssa does provide free textbooks to the school. But when it comes to hands-on work on the saporis, officials seem unwilling or unable to overcome the remoteness, even to see cnes's work, Juri Gogoi, cnes's education director, said. " ssa officials never made an effort to visit us on their own." For Thoma Khakalari, the cnes initiative provides a tiny ray of hope. "At least my six-children will be able to read the number plates of cars, street numbers," said this resident of Charakhali sapori in Dibrugarh district. "This is not a light remark," Hazarika said. "It is essentially saying that the child can move to a place where she can use knowledge, language, information, to understand and lead a different life." But given the limited options, poor quality of education, and travel times often exceeding an hour each way, many families chose not to send their children to school. Anjana Pegu, the teacher at one of cnes's new bridge schools on the Aichung sapori, noted this trend. "People drop out because of money, poverty, the kids are busy helping at home, working. Everybody works, even the little kids," she said. Out-of-school children are seen as a demand-side problem, so ssa focuses on advocating the benefits of education. "Attitude has to be changed," Dwibendu added. Panday, also observed that while "people in this village study well, often their parents aren't so encouraging--they just say, what is the point, stay around, don't go." But he also said there was a reason behind this disinterest. "Unless a child studies until at least the tenth standard, he does not have much employment opportunities," the teacher elaborated. The lack of demand for education, then, becomes understandable, given that above the fourth standard, schools are so far apart that many of the students and parents did not even know where the nearest one was. This was true even among those expressing hopes of future careers as teachers or doctors. More than anything else, the example of the health and education system shows the true remoteness of the Brahmaputra saporis a remoteness from opportunity.